The Golden State Warriors are still on fire. A new year hasn't changed that. In fact, the turning of a new page has got the Californians even closer to making history. Steph Curry continues to fire on all cylinders but that's only one secret to the Dubs' success. Draymond Green has been somewhat of a revelation while Klay Thompson is not settling for a back seat role, continuing to boast efficiency and effective scoring. Then there's the rest: a fresh, pacey and unique outfit which is well on course to claim back-to-back Championships. It's as if they picked up from where they left of in the Finals back in June. Under the tutelage of interim head coach Luke Walton, they went from strength to strength to begin the new campaign, riding an unstoppable run which saw them win their first 24 games before suffering a loss to the Milwaukee Bucks. That would just however be a mere blip in the very grand scale of things. Dallas would get the better of them significantly before a change of calendars, but what remained so stringent on Warriors' part was their persistence and consistency. What that means is the emergence of a magical number 73. It's a race for 73 season wins out of a possible 82, which will beat the 1995-1996 Chicago Bulls record of 72 wins and 10 losses. Perfection is hard to master in a game where the volume of playing time is so gigantic, and the strains on athletes evolve quicker than the sport itself, but the Warriors will come closest to it. It's a fitting time to bring it all up. Golden State marked the halfway point in the regular season by trouncing the Los Angeles Lakers and of course, Kobe Bryant. 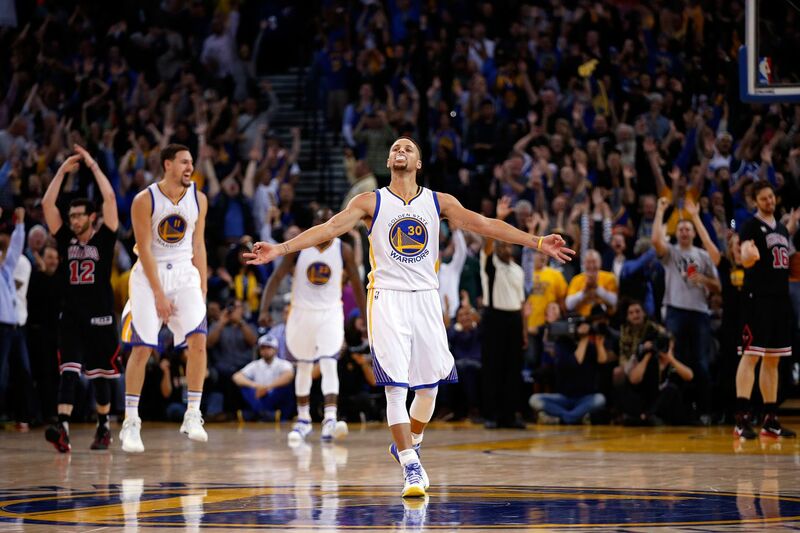 "You guys have got to go ahead and make history," the shooting-guard told Steph Curry. History is within touching distance now. Of course their remains a long trek, since they have only just passed the halfway point of the season, but it is theirs to lose. Should they only lose 6 more times in their next 41 games, they will have done it. Of course soon the question and dilemmas will come: is it now about chasing history or securing a prosperous offseason? Depending on how many games are left before attention turns towards the playoffs, soon the squad could be chopping and changing to keep players healthy. And we all know that they must be kept healthy, because in lieu of the stars, there can be weak points. It goes without saying this can be applied to any franchise in the association, but the Warriors definitely missed Draymond Green in their narrow loss to the Nuggets prior to their victory over the Lakers. Always in line to get a triple double, with digits all over the court, Green's ability to impact on both offence and defence has made him a vital component to the squad. Obviously, the loss to Denver was nothing catastrophic, but it was a little warning sign to take care off. Maybe Green is the most significant Warriors player, not Curry. But then again, voted Athlete of the Year by the Associated Press and others, along with wowing everyone who sees him on the court, Steph Curry's unprecedented 2015 could just reach new levels in 2016. If it does, consider the Bulls' record broken. Golden State will continue to chase the records and as a whole unit their standards of basketball may not be rivalled throughout the season. 73 wins is coming, and they can grab it with both hands. It's Golden Fate.